As the ‘Arab uprising’ countries are now learning the hard way, building a better future is a process that can often be expected to last just as long as surviving one’s bad past did. It is a bitter pill for local populations to swallow, particularly in countries like Libya where the euphoria of having slipped the grasp of a seemingly immortal psychopath is being ground down by the dispiriting business of overcoming his legacy. Its a lesson that well-meaning international observers seem to have an even harder time digesting, let alone anticipating (despite the fact that we have all been down this road before and should know by now that there are no shortcuts). So thats what made the taste of Bosnia’s recent qualification for the World Cup so sweet. After years of stagnant ethnic deadlock, this event seemed like something that in retrospect would be seen as an awakening from a prolonged coma. A pulse had been detected last summer when ordinary citizens finally revolted against a politics of not re-attaching your own nose to spite the other guy’s face, and then had fizzled out as disillusion and ordinary life set back in. Then suddenly, the first stirrings of something big as the Bosnian team crept closer to Brazil, beating Slovakia in September and being rewarded with its unprecedented adoption as ‘our’ team by the staunchly nationalist Glas Srpske. And then the breakthrough – and talk of a long-overdue ‘national success story‘ – as the ‘Dragons’ swept Lithuania before them and qualified last October. 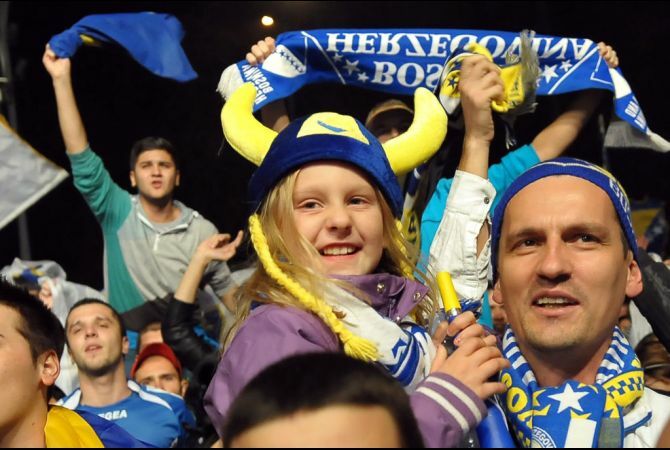 Suddenly, it seemed as if Bosnia would be redefined by pictures like this, an ordinary family celebrating the victory of a highly non-ordinary state. The new Bosnian flag that rumors attributed to an OHR intern with basic photoshop skills – and that wags said looked like the logo on a cereal box – was to flap off to Brazil with all its other more time-honored fellows. The turning of a page at last. For several years now, I have provided periodic technical advice to a European Union funded program to aid refugees and displaced persons in Serbia. Although the deck has been stacked pretty heavily against the program’s clients and the rest of the world’s attention long since wandered from their plight, it means a lot to me to be able to continue participating in picking up the pieces from the conflicts that shocked me into political consciousness back in the distant 1990s. My most recent trip came last week, for a training in Belgrade. Much on the way to Serbia was bracingly familiar, beginning with the blithe surliness of the nicotine-raspy JAT stewardesses who make you eight again and dealing with the cafeteria ladies as they slap a canned sandwich down on your bobbling tray. Belgrade itself was indecently unchanged, with its steady throng of cheerful and careworn pedestrians wandering amidst canyons of faded glory. Of all the Eastern European places I return to, Belgrade seems to change the least, not resisting so much as ignoring the tsunami of Benetton gentrification that rages all around it. This is not to say that the politics haven’t changed. In many respects, its been a banner year for the West Balkans. As Besar Likmeta recently pointed out in Foreign Policy, the accession of Croatia to the EU on July 1 capped a sequence of breakthroughs ranging from the belated election of a true reform candidate in Albania to the political galvanization of Bosnia and most notably, the power-sharing agreement arrived at between Belgrade and Pristina. At first glance, the only parties that seem bitterly divided or incapable of applying the rule of law at all these days are within the Tribunal that was meant to fix all that (on which, see Eric Gordy’s latest ruthlessness here). However, an atmosphere of palpable unease remains over issues like the delicate détente over Kosovo. The lawyers I met with last week exemplify the paradoxical nature of post-Yugoslav normalization. On one hand, there they are, Serb lawyers representing Serb clients in Serbian, working the Kosovo courts every day. The first time I went to Kosovo in early 2000, the idea was unimaginable (‘suicidal’ would not be out of place) and its realization gives some hope for a viable multi-ethnic future. On the other hand, the lawyers had a laundry list of shenanigans, underhand, bureaucratic and worse. In many senses, the uprooted and impoverished clients they represent are the most easily dispensable part of a veritable mountain of irregularities and grievances accumulated during a decade of international administration. Property claims remain a significant issue, but must be viewed alongside unresolved disappearances, highly contested privatizations, potentially massive liability to the former employees of state firms and other pending calamities. That said, the lack of trust remains striking. After dinner one evening, the conversation revolved around plots. Is this a blocking maneuver meant to distract us from that or wedge us out of there? There was some ironic laughter but an undertone of real worry. For Serbs living and working in Kosovo, a sort of elemental uncertainty that long since evaporated from more settled former war zones like Bosnia still clings. The Human Rights Advisory Panel holds the UN in Kosovo responsible for failing to investigate forced disappearances – too little, too late? In the uphill struggle to ensure the accountability of international organisations and in particular of peacekeeping missions, the recent decision in S.C. against UNMIK issued by the UNMIK Human Rights Advisory Panel (HRAP) can definitely be considered a landmark case. The HRAP is the body tasked in 2005 with examining complaints of alleged human rights violations committed by or attributable to the United Nations Interim Administration Mission in Kosovo (UNMIK). In doing so, the Panel applies the European Convention on Human Rights (ECHR) as well as other key global Human Rights conventions, and makes non-binding recommendations to the Special Representative of the Secretary-General (SRSG) in charge of UNMIK. UNMIK was established following the Kosovo crisis of 1999 with full legislative and executive powers for the administration of Kosovo. UNMIK was, tasked under UNSC Res 1244 with “promoting and protecting human rights in Kosovo” and it performed police and judiciary functions until 9 December 2008, when those competencies were handed over to the EU Rule of Law Mission in Kosovo (EULEX). Disappearances in Kosovo and UNMIK’s inaction. It is within this context that Ms. S.C. lodged her complaint. Ms. S.C. was the wife of Ah.C and mother of An.C. On the 18 July 1999 An.C and Ah.C. while working at their family business in Prizren were ordered by three uniformed Kosovo Liberation Army (KLA) members to follow them to do some work. The KLA members said they would be back within half an hour. Their bodies were recovered one year later, in August 2000, by ICTY investigators near the Prizren cemetery. It was only in 2003 that M.C., the other son of the complainant, received the bodies of his father and brother after UNMIK had issued confirmation of identity certificates. Ms. S.C. complained on several occasions, but the investigations conducted by UNMIK led to nothing. Although the bodies were recovered in 2003, the two persons were still considered as missing in the UMNiK investigation file as late as 2007. The complainants therefore alleged a violation of procedural limb of the Article 2 of the ECHR, i.e. the right to life, as well as a violation of the Article 3 of the ECHR for the mental pain and suffering allegedly caused by the situation.